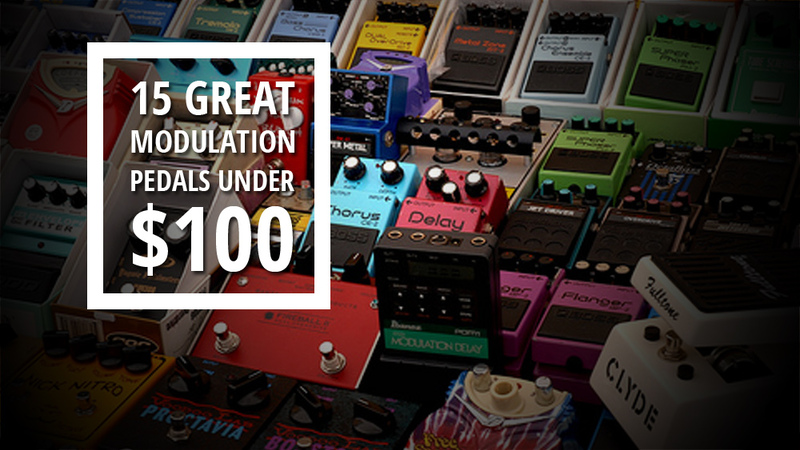 Modulation is an odd group of pedals for me. Similar to reverbs in the sense of how undesirable they were to how popular they are now. Back in the 70s to 80s, modulations like Chorus and Flanger were the rage. From post-rock, to metal, to pop, you heard it all over the place. It almost defined the sound of electric guitar in those decades. The 90s rolled around and you heard it, but typically at extreme settings – ala Nirvana leads, etc. By the 2000s rolled around you never heard it. Well.. with the exception of phasers. For some reasons those were still cool. In the last few years, I’ve seen chorus and flanger make a major come back. I almost can pinpoint it snuck in with the ‘mod’ effect delays to get the tape warble or the ‘shimmer’ in reverbs. It was only a matter of time to see the come back, and frankly, I’m stoked to see it make a come back. I’ve been doing a few posts for finding a good starting collection point of great sounding modulations, but at good entry level price points. Luckily effects in this category are really budget friendly, and there are some great ones in this list! As always, please comment below. What did I miss? What should I add. I like to update these posts with an honorable mention list. Also, let me know what you think of the modulation comeback. Like it? Hate it? Let’s hear it! Pedal Line Friday - 1/13 - Max of Totem TerrorsGreenchild G777 Dual Overdrive Give Away - The Winner! Some good stuff on here, but, considering that modulation is generally just an “effect” effect- something that you use for a couple of bars, in a couple of songs, and almost never an “always on” effect, I think this is a good place to cut a few corners- so, I would suggest looking into the Chinese- manufacturers like Donner, Ammoon, Joyo, Rowin, and Moen put out pedals that are “close enough” for use, if it’s not going to be a foundation of your sound- some specific examples are the Donner Harmony chorus, Jet Convolution Flanger, and White Wizard multi modulation, the Ammoon Vintage Phase and nano chorus ( which are identical to the Joyo pedals) and the Rowin Trill and Ensemble ( extremely small set-and-forget Tremolo and Chorus) . The Moen “Shaky Jimi” vibe/chorus is a legendary Vibe pedal- I’d put it up with the Uni-Vibe . Back in America, you can pick up BBE pedals well under 100, and I think both the Tremor dual Tremolo, and Mind Bender Chorus are fantastic, and unique sounding modulation pedals- I also know plenty of people who swear by the Soul Vibe. Again, good list you have there, just thought you might want to consider some others, too!